Seven department members attended the SOAP 2018 annual meeting that was held from May 9-13 in Miami, U.S. Drs. Michelle Gros, Shalini Dhir, Indu Singh, Andreas Antoniou, Sandra Katsiris, Ian McConachie and former OB fellow Dr. Fatemah Qasem represented the Department and presented four posters. 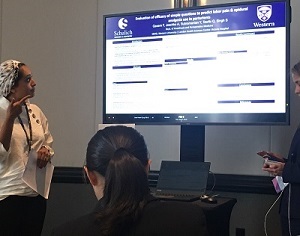 Dr. Indu Singh, Director of Obstetrics Anesthesia, presenting at SOAP 2018. Additionally, the study, "Onset of labour epidural analgesia with low-dose bupivacaine & different doses of fentanyl" by Ramesh Sai, Indu Singh, Kristine Marmai, Shalini Dhir, & Phil Jones was highlighted in the syllabus for "What's New in Obstetric Anesthesia?" which is "a review of significant & relevant literature for the OB anesthesiologist published in 2017". Anesthetic management of parturients with aortic stenosis: a compendium of case reports from the literature by Yamini Subramani, Arif Al-Areibi, and Indu Singh. US assessment of IVC in pregnancy: a feasibility study of subxiphoid & RUQ views by Fatemah Qasem*, Ahmed Hegazy, John Fuller, Ronit Lavi, and Indu Singh. Evaluation of efficacy of simple questions to predict labor pain & epidural analgesia use by Fatemah Qasem, Yamini Subramani*, Abigayel Joschko, Qutaiba Tawfic, and Indu Singh. Development & implementation of a clinical pathway for supermorbidly obese parturients having Cesarean delivery submitted by Aya Elsaharty*, Indu Singh, and Ian McConachie. 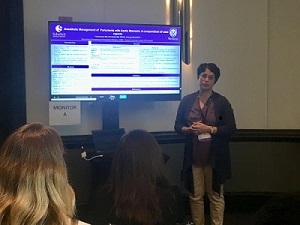 Dr. Fatemah Qasem, former OB fellow, presenting at SOAP 2018. *Dr. Fatemah Qasem recently completed a fellowship with the Department of Anesthesia and Perioperative medicine. Drs. Yamini Subramani and Aya Elsaharty are currently completing fellowships in our Obstetrics program.